Digital signage is an easy way for businesses to display multimedia content on a screen on their premises or in public. These devices can show multimedia content, which can be changed quickly and remotely via digital signage software, making it a flexible and cost-effective solution for many marketing and advertising ideas. 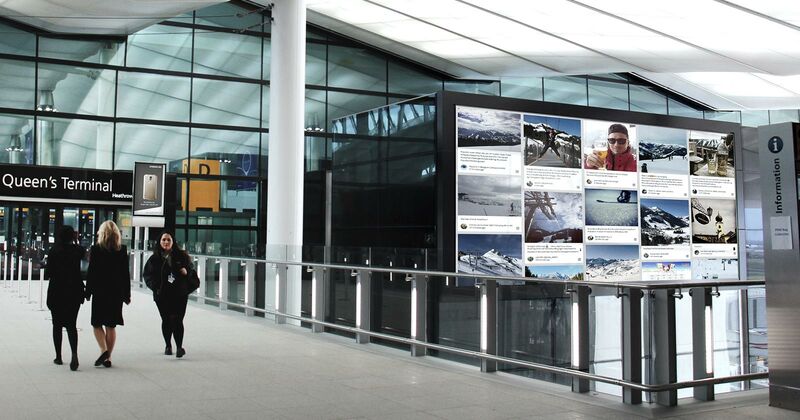 Making social media walls a part of digital signage is a logical choice. The integration of social walls on digital signage devices offers a great way to seamlessly include dynamic social content with other digital content on public screens. Walls.io customer Case Western University has integrated its social wall on a digital signage device displayed centrally on campus. Check out the Case Western University showcase to find out more! When we talk about digital signage we generally mean a central content platform that distributes content to one or more devices that can be located anywhere. It uses screens or projectors to display varying digital content like videos, multimedia content or text information. Most digital signage solutions are a combination of hardware and software: a WiFi-connected display device with a content management system. Some solutions deliver both hardware and software in one go as an ideal pairing. Others only encompass the software component but are easily displayed on any kind of device (e.g. iPads or TV screens), as long as it has a WiFi connection. The devices and software are generally easy to use and beginner-friendly, making digital signage accessible for businesses in all kinds of industries. The content management system can easily be used to remotely change the content shown on devices. No need to pick up every single device — in extreme cases, we might be talking about hundreds of devices spread around the world. Instead, users can simply change what’s shown on all of them with the click of a few buttons. To disseminate information, e.g. at hospitals, airports, etc. Advertising and branding, e.g. at bus stops, plazas, malls, etc. The possibilities for using digital signage are pretty much endless if you apply some creativity. We’ve looked at a few specific use cases to illustrate the advantages of digital signage for businesses. There are many ways to use digital signage, from small handheld screens that are put in customers hands to the gigantic billboards on Times Square. Each application brings distinct advantages and ways businesses can benefit. On a digital screen, you can easily keep content dynamic and make use of various media types and the advantages they bring. You’re not limited to text and static images anymore. Moving, bright, colourful content attracts viewers, you can call attention to your brand, your product, etc. Combine audio, video and text to create a rich experience and tell a story. You can even show multiple messages on a single screen. It’s also super easy to adapt content to season, audience, time of day or current events, if necessary. Digital signage is a great way to deliver advertising and promotional material — a fantastic alternative to old-school print advertising. The content delivered via digital signage is easily changed from within the content management system. You can try new things, change them again, adapt to what’s needed and see what works best. You could even A/B test if you found a way to measure audience engagement. All in all, digital signage allows you to experiment with your marketing in a much more cost-effective way than other media types. By delivering the same content to multiple locations from a central content management system, you can easily ensure brand consistency across the board. You can, of course, also create variety and adapt to local needs without having to be on location. By showing relevant content at the point of sale you can provide customers with more information about your brand and products and, ultimately, influence purchasing decisions. It’s also a great way to show off user-generated content, which can be used to convince potential shoppers that your brand or products are great. Put digital signage devices wherever people are waiting to entertain them or educate them and lower their perceived wait times. It keeps the queue happy and it gives you a chance to reach out to potential customers as well. 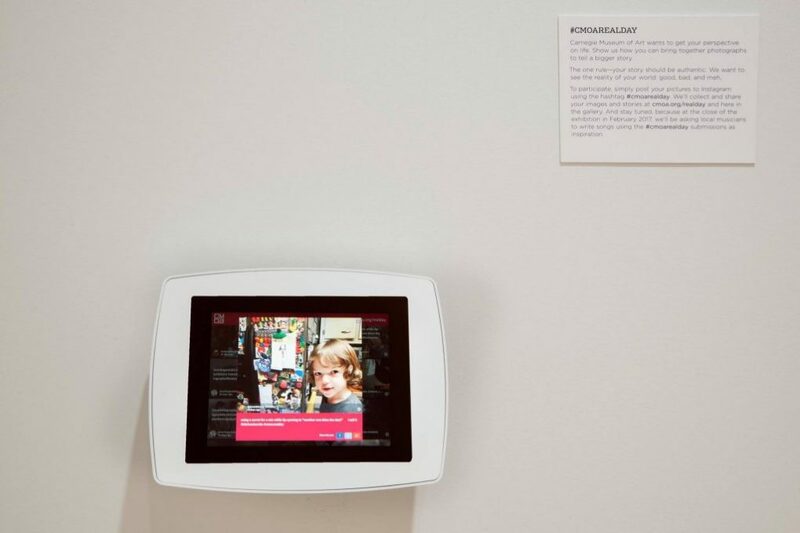 Thanks to internet connectivity, digital signage also offers ways and means to give people a chance to engage and interact with advertising. Red Bull, for example, has combined digital signage, motion tracking and gamification to get onlookers to engage actively with the brand — and ultimately get a free drink to try as well. Thanks to the centralised content control, it’s fairly easy to keep information on digital signage devices current and your information always up-to-date. This is great for informing customers of important changes, for example, wait times at hospitals, flight delays at airports, road closures, etc. Digital signage is already more cost-effective in the long run than, say, print or other forms of advertising. But it can also generate extra income for you if you decide to use it as a platform for showing content from advertisers or sponsors in addition to your own content. A social wall is a great content addition for digital signage because it offers such an easy way of putting content from multiple social media networks on your digital signage device in one go. There’s no need to input various social media sources into your content management system and then work out how you want to present them on your digital signage device. Instead, you curate and design your social wall and then simply use that as a content module. And it will look good too, whatever the device because your social wall is responsive out of the box. Meanwhile, the Walls.io spam filter and blacklist keep your content clean. With Walls.io, integrating a social wall with your content management is extremely simple. Most digital signage solutions simply let you add our widget to their content management system. But we’ve also partnered with some digital signage providers, so those will already have Walls.io pre-installed as an app in their content management systems. 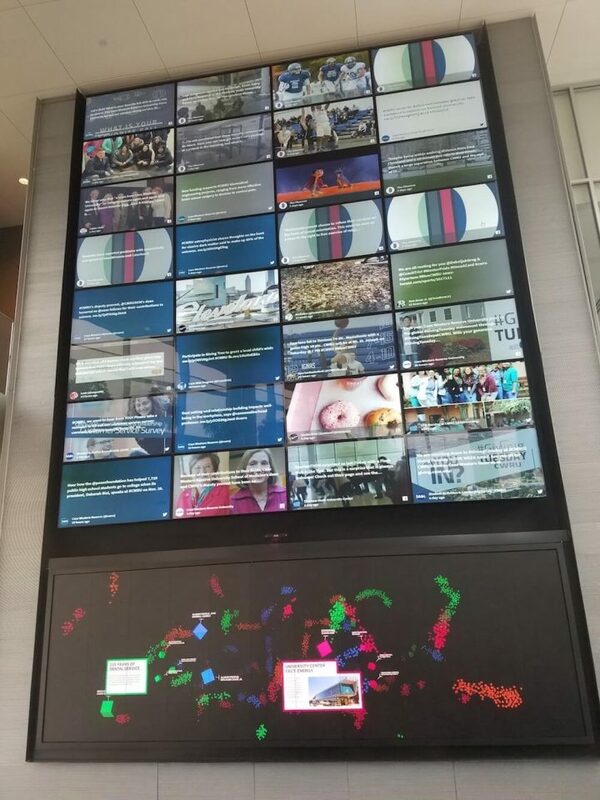 Here is a great example of how Markey Digital Signage included a social wall into one of their displays. It simply works with an Amazon fire stick and a free account. We’re currently also partnering with digital signage providers truDigital and sklera to make using Walls.io on digital signage devices even easier. Check out these free and open-source digital signage solutions as well if you are looking to get started with digital signage without spending loads of money right out of the gate. Pair a free digital signage software with an iPad or other tablet devices, a TV screen, etc. and you’re good to go!